Yes, the iPad is an obvious improvement for the game and I will be targeting it as well as iPhone. I am delighted to have the opportunity to design for a bigger device. I look forward to enjoying relaxing times with my Football Manager game on the iPad. So we now have it, we have pictures, we have information on the iPad. And it looks like Apple have got it right again. Another quality evolution of their products. 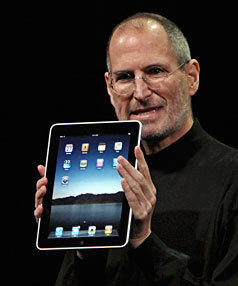 Steve Jobs makes few product mistakes, and this will build on the huge success of the iPhone. The price seems reasonable, it looks great, and it’s another target for games I write. Great! Love it! Apple are having a big impact on the games market and they are contributing significantly to the resurgence of independent games developers such as myself and with that comes a flood of creativity that an open market and distribution model enables. The growth of indie games is good for the market and good for the consumer. Indies are by nature innovative and stretch boundaries and conventions. – More games, new ideas, better games. Global Game Jam is coming up. I am so tempted to take part and make a game in 48 hours. But my role is to supervise this time. That means I have to tell people when the pizza arrives, where the toilets are, and that it is time for them to take a break and take a shower so the rest of us can breathe! Lol! It’s hot in there. What a week! Power coding. So much ground covered. Nearly at the end of it now. So now I have that part completed, robust, reliable, reusable. Now on to the next task. Still thinking about completing this, but only as a driver, an energy. It’s a case of head down, keep working towards the goal and make sure it’s good at the end of it. Today is another sunny summer day in Auckland. Good for the spirit, but I feel sympathy for people I know in Europe – snow is fun for play, but it’s cold and difficult in day to day living.